Foreverlamp™, the first manufacturer to introduce an LED replacement lamp for 1000W MH, is proud to announce that the RS Series™ 1000W Replacement lamp is now available in 52,000 lumens. As the industry’s first 1000W plug-n-play replacement lamp, the RS Series™ was designed specifically to address the needs of providing an energy efficient alternative to traditional 750W – 1000W HID lamps. The powerful LED lamp now delivers a choice of 52,000 lumens at 460 watts or 45,000 lumens at 400 watts maintaining its position as the most powerful replacement lamp lumen package available in the industry today. The RS Series™ 1000W MHO lamp will save 530 watts per socket over MH providing an eco-friendly alternative with the simple screw in replacement of a light bulb. The RS Series™ 1000W lamp is available in two lumen packages delivering both 460W (112 Lm/W) and 380W (118 Lm/W) with a CRI of 83 in 5000K. Designed for use with any open fixture and comes with a standard 5 year warranty. Known for “Big Lumen Lighting”, the Los Angeles-based manufacturer is the only manufacturer that offers both 1000W and 400W MH and HPS plug-n-play replacement lamp solutions. The Foreverlamp Replacement Lamp Series of plug-n-play bulbs features a patented cooling system and innovative design that allows for a quick and easy plug-n-play installation. Each lamp is designed to work with the existing magnetic ballast and sockets and doesn’t require any re-wiring, reconfiguration and/ or contractors to install. Installation simply involves, unscrewing the existing Metal Halide lamp and replacing it with a Foreverlamp. Foreverlamp products are key to creating efficiencies in sustainable warehouse, retail, recreational and commercial operations. These advanced LED lighting solutions enable customers to re-use their existing lighting fixtures in an eco-friendly manner by simply replacing a light bulb. Utilizing Foreverlamp products as a retrofit lamp solution can help companies significantly reduce operating costs, positively impacting employee productivity, and aide in reaching sustainability goals. 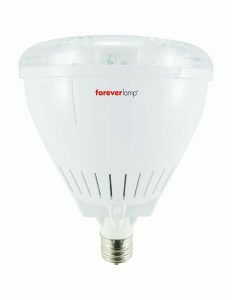 For a complete listing of Foreverlamp products, visit www.foreverlamp.com.